The hip labrum is a fibrocartilaginous structure that lines the hipbone socket, which is also called the acetabulum. It is usually triangular, but may also be round, irregular or flattened. The incidence of a triangular shape actually decreases with age, while the incidence of round and irregular shapes increases with age. The labrum acts as a shock absorber, as a stabilizer by deepening the joint, as a lubricator and assists in load distribution across the joint. Without this structure, the joint would have to withstand significantly increased loads (possibly up to 90% more, according to one study), so deterioration of the labrum eventually leads to joint degradation this often results in a hip labral tear. There is also a positive association between hip labral tears and osteoarthritis, primarily due to the increased load mentioned above. Initially thought to be uncommon, hip labral tears are becoming increasingly recognized as a significant cause of hip and groin pain as diagnostic imaging techniques improve. It has been estimated that 22-55% of patients with hip or groin pain have labral tears. Trauma, whether a single high-impact event or a repetitive event, is one possible cause of labral tears and this is typically found in the athletic population. Hip dislocation and acetabular fractures, for example, have been associated with labral tears. Sports such as football, hockey, golf and ballet, which have repetitive movements involving external rotation, place athletes at at notable risk of labral tears. Runners are also at risk, due to the load bearing exerted on the labrum from the exaggerated extending and bending of the leg. Labral tears has also been found to be increasingly prevalent with increasing age, which suggests that natural deterioration occurs as part of the ageing process . While there are known risk factors for a hip labral tear, the majority of the actual cases have no known cause. It is suggested that these cases develop over time due to repetitive microtrauma to the area. Hip labral tears are sometimes due to extreme movement, such as hyperextension and external rotation. Direct trauma, such as slipping, falling and car accidents are also known causes of a hip labral tear. Clicking, locking or catching may be experienced, with clicking being the most prevalent symptom. There may be a slight limitation in the range of motion for the hip. Clinical examination can include provocation tests, such as the anterior hip impingement test. For this test, the individual lies down facing up and the knee of the affected hip is bent and brought up to a right angle with the hips. In this position, the hip is said to be flexed. The knee is then internally rotated. If this elicits pain, this is considered a positive sign for a hip labral tear. There is also the posterior hip impingement test, where the knees and hips are extended, so the body line of the individual lying down is straight, and the hips are externally rotated. If positive, the pelvic pain will be felt. These two tests are also used to diagnose femoroacetabular impingement or FAI. Results from the physical tests, however, are inconsistent, which may be because of the different locations a labral tear can occur. After clinical examination, diagnostic imaging should be taken of the area. Initially, plain radiographs can be obtained and can help to exclude other possible pathologies. This is crucial in making a diagnosis of a hip labral tear since this condition is difficult to diagnose definitively and is usually diagnosed based on an exclusion of other possible pathologies. For the labral tear, the radiograph usually appears normal, though some show degenerative features and other abnormalities. Computed tomography or CT scan is not a reliable method for diagnosing labral tears, while the magnetic resonance imaging (MRI) technique produces false results and is like than 40% accurate or sensitive in detecting labral tears. Magnetic resonance arthrography (MRA), produces better results, reportedly up to 91% accurate. MRA, however, also has its limitations. Arthroscopy is considered the gold standard in diagnosis. Usually, treatment for a hip labral tear is initially conservative, with rest and the use of pain relief medication such as non-steroidal anti-inflammatory drugs (NSAIDs). An appropriate physical therapy program can be developed as well. Limited weight bearing can also be recommended. If conservative treatment does not work, surgery can be considered, which can be either arthroscopic or open surgery. Groh MM, Herrera J. A comprehensive review of hip labral tears. Curr Rev Musculoskelet Med. 2009;2(2):105-17. doi: 10.1007/s12178-009-9052-9. PubMed PMID: 19468871; PubMed Central PMCID: PMCPMC2697339. Lewis CL, Sahrmann SA. 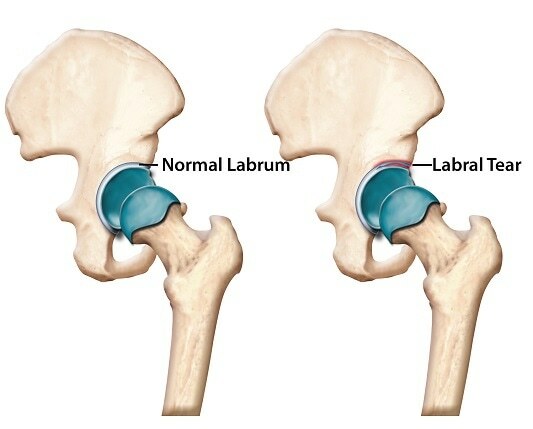 Acetabular labral tears. Phys Ther. 2006;86(1):110-21. PubMed PMID: 16386066. Philippon MJ, Faucet SC, Briggs KK. Arthroscopic hip labral repair. Arthrosc Tech. 2013;2(2):e73-6. doi: 10.1016/j.eats.2012.11.002. PubMed PMID: 23875153; PubMed Central PMCID: PMCPMC3716192.